I beg the readers of this blog to grant me an exception. I know that you are used to reading on these pages stories that took place in the past centuries and, most likely, you will feel disoriented to find, this time, the chronicle of an event that took place only a little over a week ago. But I believe it is worthwhile to tell you about the “Resolution Day”. It was, in fact, one of the most successful and innovative equestrian events in which I have ever participated. 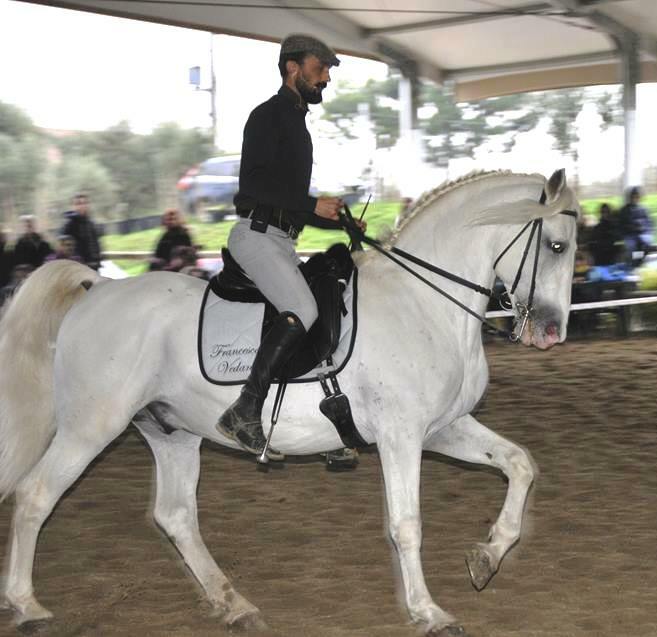 It was organized by Francesco Vedani and his Ars Equitandi Academy, in the Spia d’Italia Riding Center in Lonato del Garda (Italy) and took place on Sunday, December 3. And, as this blog is dedicated to the history, culture and traditions of classic horsemanship, I think this is the right place to give my report of the event. In my opinion, the Resolution Day was a new and significant event in Italian equestrian culture and deserves to be in the company of other noted historical events. It was innovative, featuring people of different personalities and backgrounds, who expressed in different ways their common love for the horse and for good horsemanship. And it was significant because it was marked by the participation of a large and highly motivated audience, who defied the bad weather following very carefully all the phases of this intense day. This event demonstrated that an enthusiasm, showing the growth, in my country, of a new sensitivity towards a more refined and respectful equitation, is now being combined with the growing desire of many riders to deepen their knowledge in the field of equestrian culture. “I wanted to put together in a single happening with most of the things I like,” said Francesco Vedani at the beginning. And, indeed, the eccentric formula of the event faithfully reflected the traits of his eclectic personality. 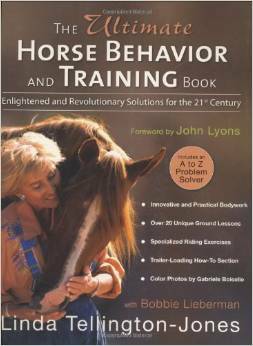 The underlying theme was the rehabilitation and retraining of problematic horses. Some specimens, freely presented by their owners, were treated first from the ground and then from the saddle by Francesco, who explained his equestrian philosophy, inspired by a classical ideal of lightness. 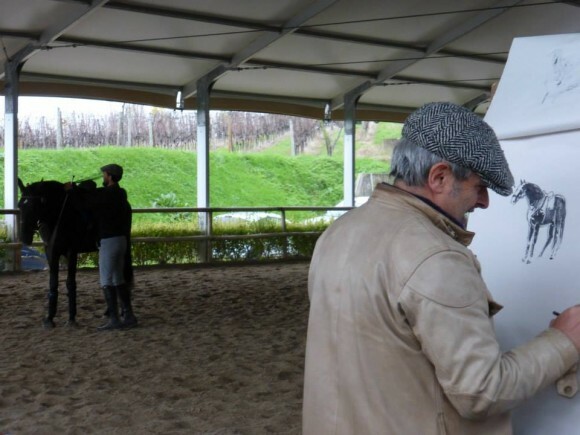 The same horses were then used by Massimo Da Re to demonstrate the use of the Tellington TTouch method. Da Re is a veterinarian and one of the most active and influential advisers in Italy of this new approach of communication with the horse. He has also translated and published in Italy the most exhaustive book by Linda Tellington-Jones. 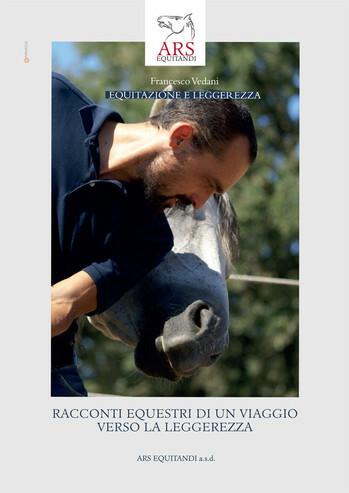 I was given the task to talk about the importance of equestrian culture and I chose to speak especially of Marco de Pavari, a mysterious Italian horseman who lived in the sixteenth century and left to us a very rare book, primarily devoted to the rehabilitation of problematic horses [the text of my speech will be published on these pages in the next days]. To further enrich the contest, the graphic and visual designer Stefano Marchi and the young illustrator Sofia Boccato reported live, through their designs and sketches, what was taking place during the event. 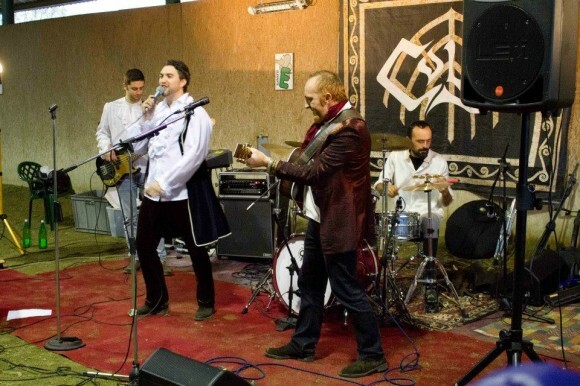 Finally, there was the performance of the Court, a rock band which has already published four albums and has received several international awards and, in which, Francesco Vedani plays the drums. Three horses with different problems were presented during the day: two mares, an Arab and a thoroughbred, and a Lusitano stallion. Although none of these horses showed “extreme” defenses, the resistances of each of them were clearly visible and were quickly “resolved” by Francesco, who showed an extraordinary equestrian “tact”, both by identifying the root of causes and then removing them by means of appropriate work (albeit in the short time of a public demonstration). It should be stressed that Francesco had not seen, nor ridden the horses prior to the day of the event. But what I really want to emphasize here is not so much his “performance” (even if, of course, it is relevant), but the aspect that I found most interesting, which was the practical demonstration of work based on non-coercive methods, inspired by the canons of classical horsemanship, and how it can be so effective in removing resistances from all types of horses, producing a harmonious understanding between man and animal. Francesco has also presented his 16 year old Lipizzaner, Betalca. 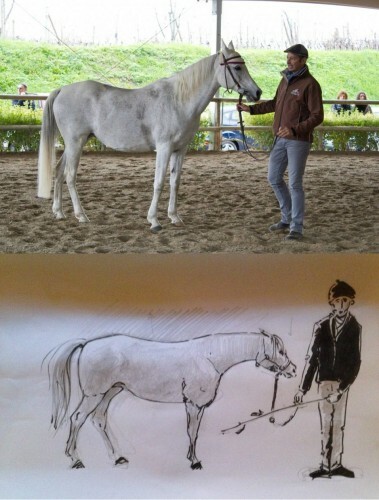 A beautiful horse that he has been retraining for about nine months and was “performing” in front of a large audience and in a new a place for the first time. With Betalca, Francesco was able to show what the results are from the longer period of this type of training that he uses with his horses. The goal is to have a horse which is calm, willing to work and able to perform all the exercises of dressage, through the application of discrete aids, allowing him to freely and fully express the brilliance of his movements. The approach of Massimo Da Re was as well very interesting. With his polite style, he offered a very inspiring demonstration of the Tellington TTouch method’s potential. I found, particularly significant, the idea that man can not only manipulate the body of the animal to change his posture and enhance his physical wellbeing, but that by doing this, he can also improve the horse’s emotional balance and performance. For example, working with the Arabian mare that had a tendency to raise her head and to quicken her gaits, Massimo highlighted that the high position of her neck and head was a clear symptom of the activation of her flight instinct. However, from this banal observation Da Re deduced a corollary which was not at all taken for granted: that training the horse to lower his head, he said, you get the effect of disabling his tendency to flee. It is therefore possible to induce calmness by acting on posture! 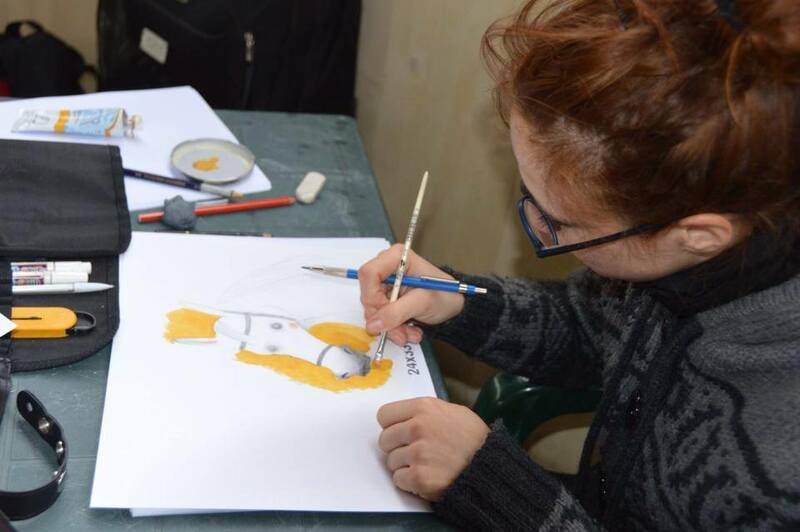 Finally, the unprecedented combination with graphic arts and music was very inspiring. 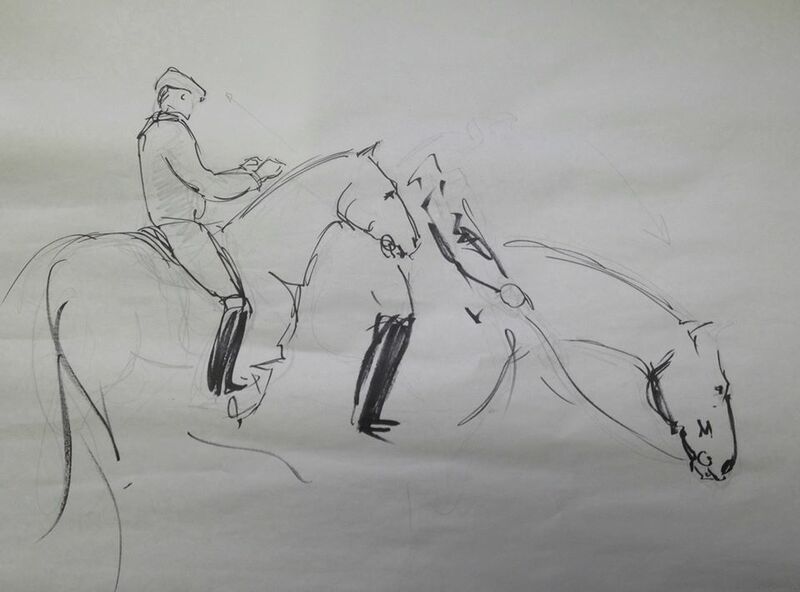 Although these arts did not have any direct link with horseback riding, they instead gave a very interesting contribution of creativity to the event, because riding is not a mere practice, but is actually a world of it’s own, a way of life (as I took the liberty to point out in my speech). And, as shown with the accompanying art and music, there is nothing like fantasy and beauty to make life richer and more fruitful…. perhaps only irony. And it was with his captivating ability to not take himself too seriously, that Francesco involved all of us, demonstrating his charisma and his humanity – a style that I really appreciate, because irony is the most pleasant mask of intelligence. In short, for me, with this initiative, Francesco Vedani (who was assisted with great professionalism in the organization by Giulia Barberis) has proven to be one of the most interesting personalities of our equestrian scene. The Resolution Day was a successful experiment. To be repeated. (Stefano Marchi hasn’t a personal website, but you can contact him on Facebook). Un articolo degno e bellissimo per un evento che aspettavo da tempo: un bel risultato per Francesco Vedani, meritato in pieno, e una gustosissima sintesi di Tomassini danno nuova e culturale linfa per QUESTA equitazione: quella diversa dalle mode che affonda nell’essere e nel sapere. Grazie a tutti. Ne avevamo tanto bisogno.